LawlerDavis offers a bespoke financial planning experience using the ethos “Personal Professional Planning”. We believe we are different because of our passion for our clients. 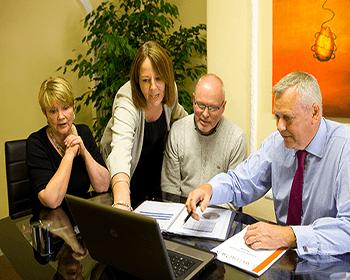 LawlerDavis Independent Financial Planners Ltd was set up by Sarah Lawler and Colin Davis, with the vision to bring back a personal service to financial planning. Our clients have told us that they value the personal level of service we offer, together with our experience and technical knowledge, and this is central to our ethos of “Personal, Professional Planning”. Every new client is offered an initial meeting, without charge or obligation with a fully qualified financial planner. At this meeting we will listen to you and discuss your financial objectives. At the end of the meeting we will make our suggestions for the next steps towards a tailored, yet realistic solution to your needs. We will also be able to give you an idea of our fees to implement the solution. There is no obligation to proceed at this stage, and no costs will have been incurred. We believe we are different because of our passion for our clients. We are committed to delivering a personal service and knowing our clients often as friends, as well as on a professional level. Financial Planning can be a complex and technical subject. We are committed to helping our clients understand exactly what we are doing for them by removing jargon and providing clear and concise explanations. We will clearly explain our fees and obtain your agreement before carrying out any chargeable work for you so that you will always know in advance exactly what our charges will be. Everyone at LawlerDavis is committed to providing an exceptional service to our clients. We believe in offering a tailor-made solution rather than a “one size fits all” approach.